EiA Combat Result Calculator is a tool to calculate combat results for Empires In Arms board game easily and thus speeding up the game a bit. Also, it is very helpful if the need for modifier adjustments arises afterwards. To use it you need OpenOffice 3.1 or newer. Several cells has notes to help and remind user for the purpose of the issue. Move the cursor over the red dotted cell to see the note. The colors used are probably not the best and I am sorry about that. Unfortunatly colors cannot be selected freely and thus I was forced to use predefined colors. Hopefully you can live with that. In general light colors are editable whereas dark colors cannot be edited. Combat calculations are printed on white or light gray. Attacker has orange color and defender has blue. Positive numbers and zero are shown in black and negative numbers are in red. 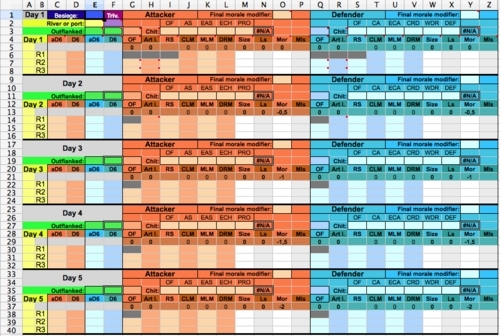 First four tabs are used for resolving a combat and the last three are helper tables for result calculation. Attacker tab is used for setting up attacker's forces. 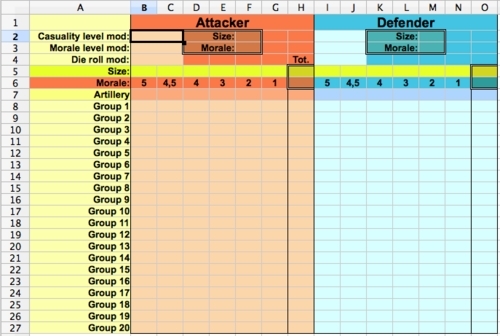 Defender tab is used for setting up defender's forces. Troops tab can be used to check attacker's and defender's forces side by side. Fight tab is where the combat is resolved. 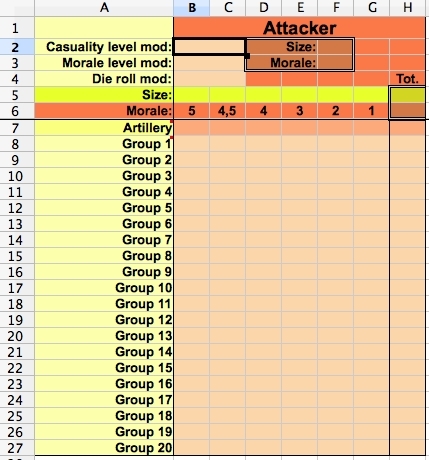 Combat table tab has the troop and morale losses tables which are used for resolving combat. 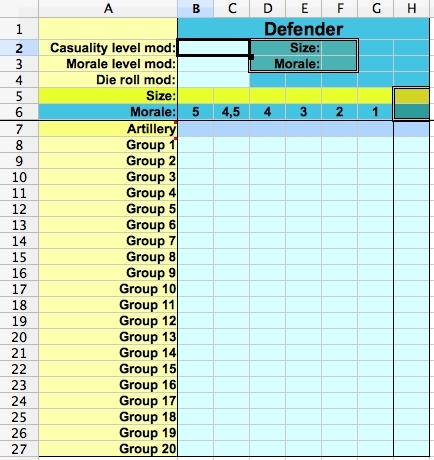 Operations table tab is used to figure out casuality and morale levels based on drawn chits. Rules tables are not used in the combat result calculator in anyway but are here only for reference. These tables are corrected and are in practice the same that can be found from http://eia.xnetz.com/. The easiest way to create a blank combat sheet is to double-click EiA Combat table.ots file. Because it is an OpenOffice template double-clicking it automatically creates a new clean combat sheet ready for use. Attacker sets up his forces on Attacker tab (should be automatically open after creating a new blank sheet). Number of forces are written under suitable morale column(s). You can divide your troops in multiple groups if you like, except for artillery which must be set on artillery row. Otherwise you can divide your troops as you see fit. Don't forget to set the terrain modifiers to the above modifier cells. All the above modifiers can be changed every round during the fight. The idea is that you need to set the modifiers in a Fight tab between the combat rounds only if it is necessary. Defender sets up his forces on Defender tab. This is done exactly like setting up the attacker's forces. See details from Step 2, Attacker enters his forces. From Troops tab both, attacker's and defender's, forces can be examined side by side. After revealing chits mark a proper chit column for the attaker and the defender. If outflanking occurs mark the outflanking forces to a proper cell. Set a proper Final morale modifier to adjust moral level to a correct one. Put letter x in E3 (single bordered cell) if the outflank succeeded after the first round. Write x in D3 (double bordered cell) if the outflank succeeded after the second round. Outflanking force combat losses in appropriate cells in OF column. Artillery combat losses in appropriate cells in Art l. column. Put the size of the reinforcement in RS column. Roll other combat and mark the result in D6 column. Again, the losses are calculated immediately. Repeat phases above until the combat is resolved. Remember to make all the necessary adjustments when the day changes. After the combat has been resolved you can save the combat sheet if you like. Or, you can simply discard it. It's up to you.